As in my post last year on how I learned the formula to finish Quran on time of Ramadan. 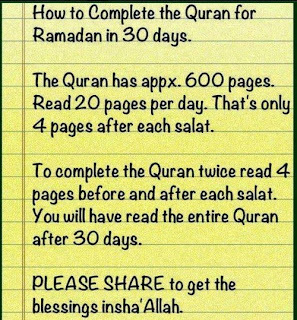 Unfortunately I didn’t finish the whole Quran last year with 2 juz left. Alhamdulillah it became one mission for Ramadan this year and it is one thing that make me exciting in this special month. 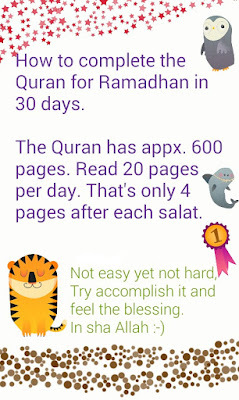 Since I get Ramadan greeting early, Playing in my mind on how to achieve my mission. 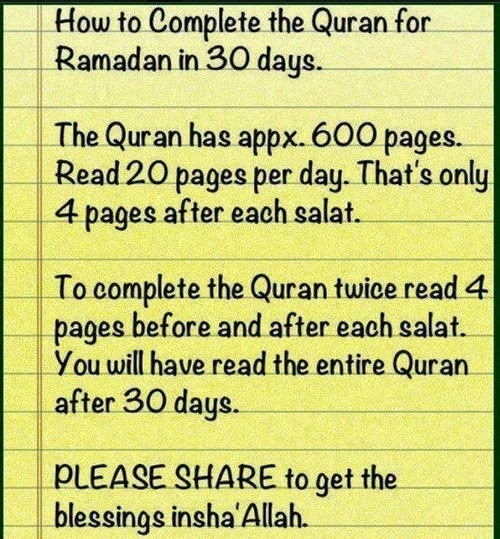 Cannot wait for the next, next day, I start my tadarus 3 days before Ramadan. Hihihihihi… thus I’m in juz 3 on the 1st Ramadan.. hahaha.. Alhamdulillah ya Rabb, I’m happy doing that simple ibadah.. Alhamdulillah ya Rabb I’m feel calm and being loved.. Alhamdulillah ya Rabb, I’m doing it sincerely not as routine.. I want to change to be better, to be close to Him, I want to seek His blessing and hidayah, many things I’m doing is wrong and wasteful and sometimes I think I’m becoming more and more bad. Thus I want to work hard in this blessing month seek forgiveness and changing to be better. Amin..